February 1519 a fleet of eleven Spanish ships landed on the coast of Mexico near the modern day port of Vera Cruz. Onboard was a force of nearly six hundred Conquistadors; led by the infamous Hernán Cortés, they had come to Mexico to conquer the land and convert its people to Christianity in the name of the Holy Roman Church… And if they all got filthy rich in the process — that was okay too! Montezuma dispatched servants bearing rich gifts for the newly arrived gods in hopes that they would go away and leave him in charge. But Montezuma’s plan backfired – when Cortés saw the precious objects, crafted from gold and silver, he knew he’d come to the right place – he immediately set his sights on the Aztec’s capitol city of Tenochtitlán, (present day Mexico City). 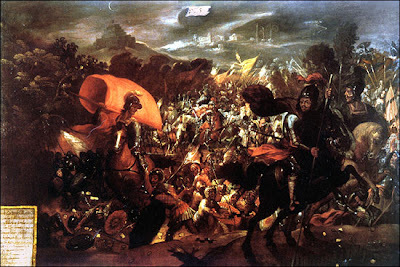 With their hostage dead, Cortés and his men were forced to flee the city. They retreated amid a full on uprising, attacked from all sides by Aztec spears and stones. As the conquistadors fled the city, they threw down their newly won fortunes, littering the cities’ network of concentric irrigation channels with the treasure they had stolen from Montezuma’s treasury. Many of Cortés’ men died on that dark and rainy night. It’s said that the bodies of the dead were piled so high in the citie’s canals that one could walk across them, from one side to the next – a grisly bridge of corpses. The night came to be known as La Noche Triste (The Sad Night). Cortés rebuilt his army and a year later returned to Tenochtitlan. On August 13, 1521, with the help of his Tlaxcalan allies, Cortés took the city back. 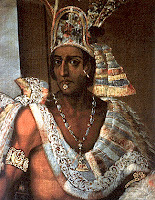 The new Aztec emperor, Cuauhtémoc, was captured while fleeing the city and tortured to reveal the locations of the Aztec treasure. But even with his feet held in a fire, the doomed Emperor couldn’t produce more than a canoe full of trinkets. 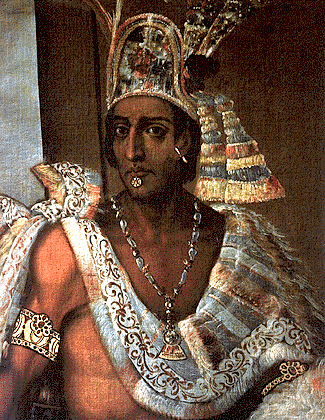 According to Cuauhtémoc, the treasure was forever lost. There is much disagreement about just how far north the exodus traveled, but certainly the most interesting theory circulating among the treasure hunting community is that the treasure was carried over two thousand miles to southern Utah. A few miles east of Kanab, a deep canyon slices northward through the Vermillion Cliffs of Grand Staircase–Escalante National Monument. Johnson Canyon has an eclectic past. During the 1870’s the infamous John D. Lee, chief perpetrator in the Mountain Meadows Massacre, called the canyon home. In the mid-1900’s it served as movie set for multiple Hollywood westerns. While being featured in Gunsmoke was no doubt a prestigious achievement, what really fascinated me was the canyon’s central role in one of Utah’s biggest treasure hunts. In 1914, a man named Freddie Crystal walked down Main Street in Kanab clutching a treasure map. He claimed that his map revealed the hiding place of King Montezuma’s fabled Aztec treasure. When the outsider inquired around town, obliging locals informed Freddie that his map resembled a section of the White Cliffs northeast of the city limits. Crystal spent several years fruitlessly scouring the area, until he ran across some moqui steps carved into the canyon wall. 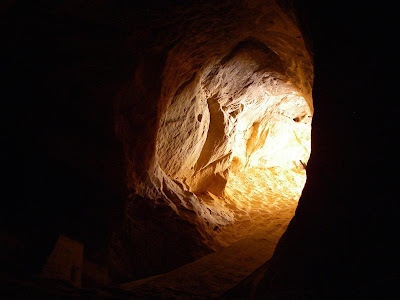 Alongside the carvings, he found what appeared to be three sandstone tunnels. One of the tunnels, he claimed, was blocked off with stone and mortar foreign to the area. Mr. Crystal returned to Kanab seeking help. In return, he promised to share the abundant treasure lying in wait. Crystal and his newly gathered posse of Kanabites pitched their tents at the base of the White Cliffs near Cottonwood and Skutumpah Canyons. As they commenced digging, the group allegedly found multiple chambers and side passages within the cliffs; some blocked off with stone and mortar, just like the tunnel entrance had been. After a few months of digging and no treasure to show for it, most of the residents gave up their dreams of riches and resumed the normal routine of their lives. 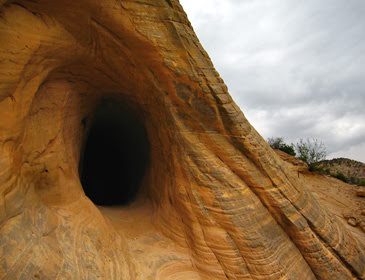 All the explorers had found in the cliffs was a sandstone chamber housing a few Native-American artifacts and human remains. Crystal, however, remained convinced that he was hot on Montezuma’s trail. He spent several more years in the canyons surrounding Kanab, searching for signs. Freddie Crystal believed the Aztecs had chipped those passages out of the sandstone cliff to serve as a secret cache for their riches. He subscribed wholeheartedly to old legends claiming that King Montezuma spirited off a portion of the Aztec royal treasury during their conflict with Cortez and the Conquistadors. In the spring of 1989, Grandt Child came up with another theory. He decided that the real hiding place was not in Johnson's Canyon and the signs in the canyon were a ploy to divert attention from the real hiding place. 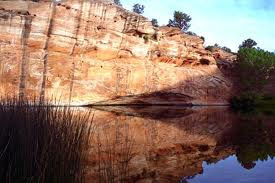 Child believes the treasure is in the lower pond of the three lakes chain, six miles north of Kanab on Highway 89. He found an Aztec treasure sign, a circle with an arrow pointing down, carved in the rock 8 feet above the water level on the wall above the lakes. The site fits the criteria for an Aztec treasure hiding technique, called a "water trap." Tony Thurber, friend of Child's, made a dive to explore the lake. 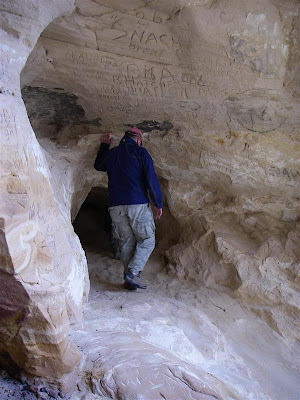 Under the treasure sign he discovered a tunnell about four feet wide and seven feet tall that appeared to be handmade. When Thurber got 30 feet into the tunnel, he was disoriented and couldn't tell if he was going down or up, or in or out. He said he got caught in a heavy draft and was afraid he might get swept into an underground river. He finally found his way out. He went down again with a tether line attached, but surfaced. He got concerned when he found the line limp rather than taut as it should have been. The person holding the line said it had been taut the whole time. On June 22, 1989, Thurber returned with three professional divers. The divers got 70 feet back in the tunnel. Their sonar equipment showed the tunnel was 100 feet long and ended in a room 80 feet in diameter. Detectors registered heavy metal at the end of the tunnel. It was late, so they quit for the day. That night Russ, one of the divers, had a dream. In the dream he swam back to the cave, an Aztec warrior with a spear was waiting and threw the spear at Russ when he surfaced. Russ was the first to go down the next morning. At a certain point in the tunnell, he started screaming that someone was grabbing and choking him. As he was pulled from the water he appeared white as a sheet. Another diver went down and had the same experience. The divers left and returned in two weeks. They experienced the same choking sensation in the tunnell and had to be pulled up. The diving crew did not dive in the lake anymore. Childs decided on a plan to drain the lake. To his surprise, the pond happens to be the only known habitat of the Kanab Amber Snail. The property was fenced off by the U.S. Fish and Wildlife Service. Then in December of 1991, 11 geese were mysteriously placed in the pond. The gaggle of geese was accused of eating the Kanab Amber Snails. The agency decided to capture the suspects and force them to vomit. After gathering the evidence, the geese were donated to an animal sanctuary. Killing one of the endangered snails is a serious offense and carries a fine of up to $50,000 per snail. No one came forward to claim the geese. Information courtesy Southern Utah News, June 27, 1990. In 1865, a prospector by the name of Jim White was rafting down the Colorado River. He claims to have discovered a cave that contained thousands and thousands of golden idols and other objects, Montezuma’s treasure. White reached civilization after weeks of hardships. He was starving and delirious when he got to a town. He said the cave was located near the ruins of an old Indian camp on the south bank of the Colorado in the Lower Granite Gorge of the Grand Canyon, about three miles from Pierce Ferry. Many searches have turned up nothing. Some believe that when the inhabitants of Tenochtitlán got wind of the Spaniards return, they buried the remains of the city’s treasure in and around Lake Tezcuco to prevent it from falling prey to the gold-crazed Conquistadors. Today, a vast treasure trove may still remain hidden beneath nearly five centuries of mud and sludge on the outskirts of Mexico City, the modern day incarnation of Tenochtitlán. Generations of treasure seekers have sought the lost hoard without success. A former president of Mexico even had the lake bed dredged, but no treasure was found. Some believe there’s a link between the Legendary Lost Dutchman’s Gold Mine and Montezuma’s Gold. Jacob Waltz, (the Dutchman) found a source of pure, raw gold in the Superstition Mountains of Arizona, a location geologists say is devoid of gold deposits. It’s this apparently lack of mineral evidence which has led some researchers to speculate that the Dutchman may have actually stumbled over Montezuma’s fabled Lost Aztec Treasure. I'm surprised that Child's pond didn't have some big mouthed bass. Who wants to go camp in Kanab with me and get a little more intel on this?! In my earlier life 1960.s and even up to around 1986 or so I was more interested in this stuff than today but it still intrigues me some. My childhood home, where I grew up is in Alton Utah about 40 miles from this lake. And when I lived in Vernal Utah I even hade a claim on an old Spanish mine aria in the High Uinta mountains by Vernal . Just some interesting stuff to me and maybe to you. Have fun. Be careful if you go poking around 3 Lakes near Kanab. Some others have experienced odd things there. I lived in kanab 1993-1998.